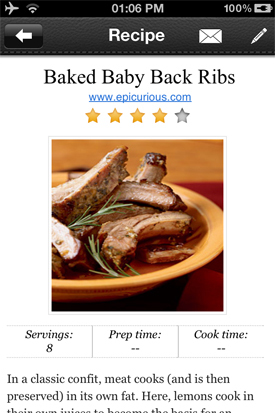 Here is a review of another app for foodies. 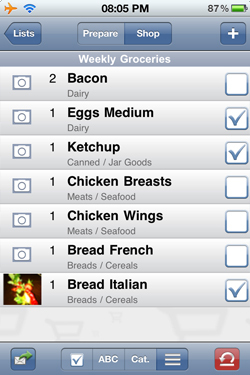 Grocery Gadget is one of the most powerful grocery and shopping list tracking tools in the app store. In fact, it was recommended by Apple as one of their top apps for a period of time. 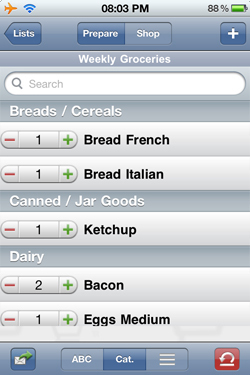 The basic version ($0.99) allows you to track all your grocery needs. The advanced version ($3.99) allows you to scan bar-codes, sort by prices, color code by prices, match eCoupons to items you’re purchasing and more. Both versions allow you to quickly and easily backup all your data to Grocery Gadget’s servers. 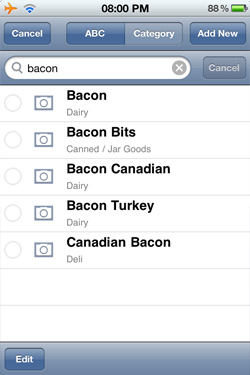 You can also share all your shopping lists with anyone else who has Grocery Gadget. All your groceries are automatically sorted by aisle to make shopping easier. 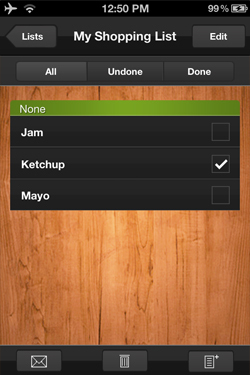 Here’s how to use Grocery Gadget to manage your shopping lists. To backup your data automatically and to share your data with other people, you need to first create a group. Click “Group” on the bottom left of the home screen. Click “Sign Up” to create your group. Note that even if you have no intention of sharing shopping lists with others, you still need to create a group to backup your data. You’ll just be a group of one. Fill out the registration form to create your group. 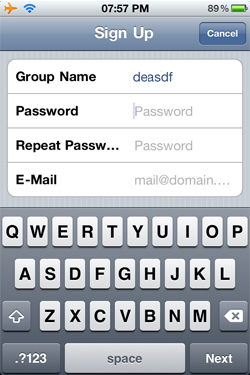 Your email is only used in case you forget your password. You won’t receive email offers from Grocery Gadget. Upon the creation of your group, all your data will automatically be backed up. If you want to share your data with other people, just give the other people who you want to share with the login information for your group. Everyone who’s in the same group will automatically sync with one another. By default, when you enter a list you’ll be in Shop mode. If you’re still preparing your shopping list however, you want to be in Prepare mode. Click “Prepare” at the top to switch. Type in the name of the food that you want to add to your shopping list. 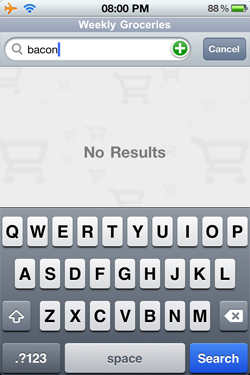 Click the “+” button to initiate a search. You’ll be presented with a list of all the options that your search query matched. Select the one that you want to add to your list. Then choose how many of that item you want to purchase. 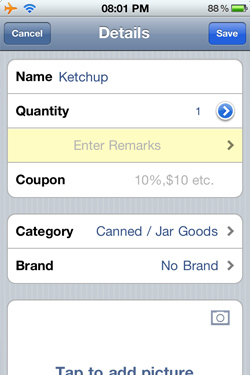 You can edit the item’s name, quantities, available coupons, category and brand. 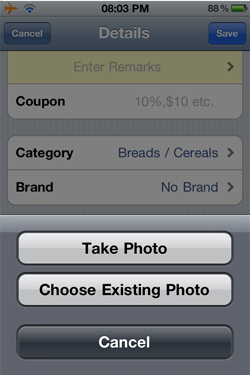 To add a photo to any item on your shopping list, just click the “Tap to Add Picture” button. You can either choose to take a new photo or select one from your library. 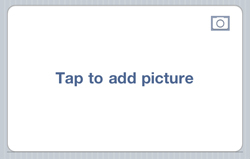 Once you’ve added a photo, the photo will automatically be displayed next to that item in your shopping list. Keep adding more items until you’ve completed your shopping list. You can sort your list alphabetically by clicking “ABC,” by categories by clicking “Cat.” or according to the order you added it by clicking the list button. Once you’ve added all your items, it’s time to shop. 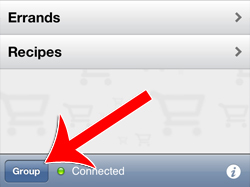 Take out your app in the supermarket and hit the “Shop” button at the top to switch to shop mode. Shop mode works quite simply: Just check the items you’ve picked up already on the right. 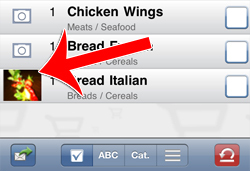 To sort your items by category, click “Cat.” To sort them by how you added them, click the list button on the right. To sort alphabetically, click “ABC.” Most people however will want to use the checklist mode, which is in the lower left corner. Checklist mode will move any item that you’ve checked off to the very bottom of the list. In other words, you’ll easily be able to see which items you still have to grab just by looking at the top half of your list. It’s that simple! You can easily switch back and forth between modes to make shopping easier. For example, you can start off in category mode and zip from aisle to aisle picking up many things at a time. Then, once you only have a few items left, you can switch to checklist mode to quickly see what you still need to pick up. 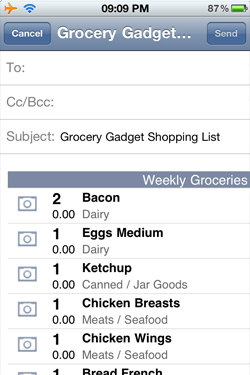 If you need to share your list with someone who isn’t on Grocery Gadget, you can do it through email. 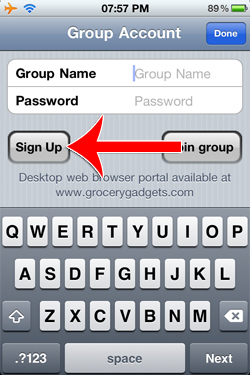 You can also notify others in your group when your list is updated. To do either of these things, click the button in the lower left corner. Then select which action you want to perform. 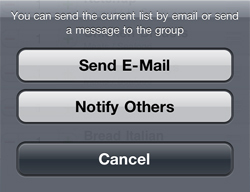 If you choose to notify others, a notification will be sent to everyone in your group. If you choose email, this screen will pop up. Just type in the recipient’s email to send your pre-built shopping list. 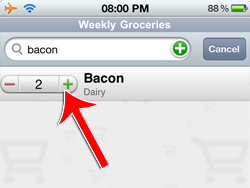 That’s how to use Grocery Gadget to build comprehensive shopping lists. 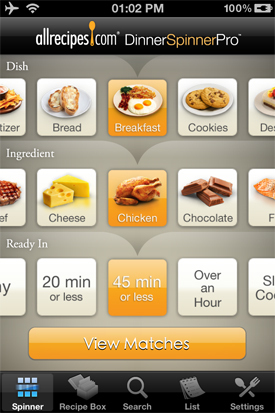 Grocery Gadget’s many different sorting modes makes shopping for what you want extremely easy. The group sharing and email features make the app very versatile for families or for planning events. When it comes to shopping lists and grocery planning, Grocery Gadget covers just about everything you need. Feel free to add to my Grocery Gadget review by typing your comments below.